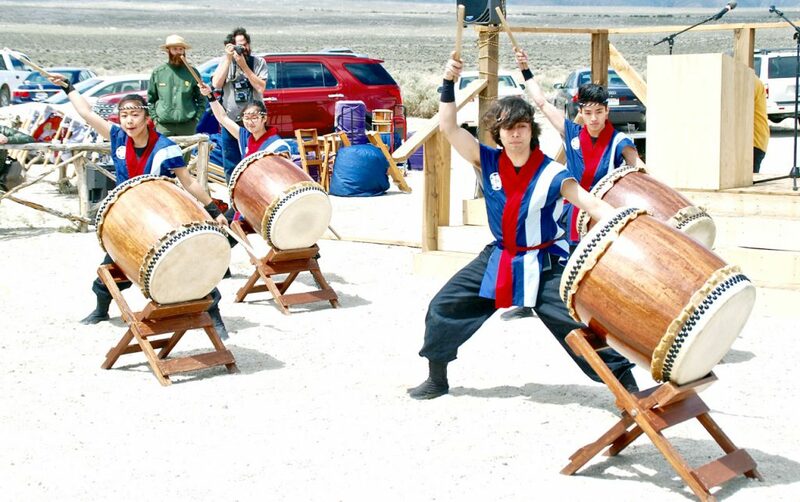 UCLA Kyodo Taiko performs at the 47th annual Manzanar Pilgrimage in 2016. LOS ANGELES — UCLA Kyodo Taiko will perform at the 48th Annual Manzanar Pilgrimage, sponsored by the Manzanar Committee, on April 29 at the Manzanar National Historic Site. UCLA Kyodo Taiko will open the program at 11:30 a.m., while the main portion of the program will begin at noon. Each year, more than 1,000 people from diverse backgrounds, including students, teachers, community members, clergy and former incarcerees, attend the pilgrimage, which commemorates the unjust incarceration of more than 110,000 Americans of Japanese ancestry in 10 American concentration camps, and other confinement sites, located in the most desolate, isolated regions of the United States, during World War II. Manzanar was the first of the American concentration camps to be established. Making its 11th consecutive appearance at the Manzanar Pilgrimage this year, UCLA Kyodo Taiko is the first collegiate taiko (Japanese drum) group in North America. Its members made their debut at the Opening Ceremony of the University of California, Los Angeles’ commemoration of the 50th Anniversary of the Japanese American Internment, which was held in February 1992 at UCLA’s famed Royce Hall. UCLA Kyodo Taiko is comprised entirely of UCLA students. The group has performed annually at local K-12 schools, Nisei Week, Los Angeles Tofu Festival and the Lotus Festival in Los Angeles, the Intercollegiate Taiko Invitational, during halftime at UCLA basketball games, as well as the first annual USA Sumo Open, in addition to many other campus, community and private events. In addition to the afternoon event, the Manzanar At Dusk program follows that same evening, from 5-8 p.m. at the Lone Pine High School gymnasium. The Manzanar Committee has also announced that bus transportation to the Pilgrimage will be available from Los Angeles’ Little Tokyo and Gardena, Calif. The Little Tokyo bus, sponsored by the Manzanar Committee, will depart at 7 a.m., arriving at the pilgrimage at approximately 11:30 a.m. It will also take participants to the Visitor’s Center at the Manzanar National Historic Site following the afternoon program. The bus should arrive back in Los Angeles at approximately 8:30 p.m.
Reservations for the Little Tokyo bus will be accepted on a first-come, first-served basis, and seats are going very fast and are expected to sell out quickly. The nonrefundable fare is $40 per seat, $20 for students and seniors (65 or older). Complimentary fares are available for those who were incarcerated at any of the former American concentration camps or other confinement sites during World War II. The bus from Gardena is sponsored by the Gardena Valley Japanese Cultural Institute. Information on their bus to the Manzanar Pilgrimage can be found on the GVJCI web site (http://www.jci-gardena.org/upcoming-events.html) or by calling (310) 324-6611. Both the Manzanar Pilgrimage and the Manzanar At Dusk programs are free and open to the public. The Manzanar Committee is dedicated to educating and raising public awareness about the incarceration and violation of civil rights of persons of Japanese ancestry during World War II and to the continuing struggle of all peoples when Constitutional rights are in danger. A nonprofit organization that has sponsored the annual Manzanar Pilgrimage since 1969, along with other educational programs, the Manzanar Committee has also played a key role in the establishment and continued development of the Manzanar National Historic Site. For more information, or to reserve a seat on the bus, call (323) 662-5102 or e-mail 48thpilgrimage@manzanarcommittee.org.